October is Breast Cancer awareness month. 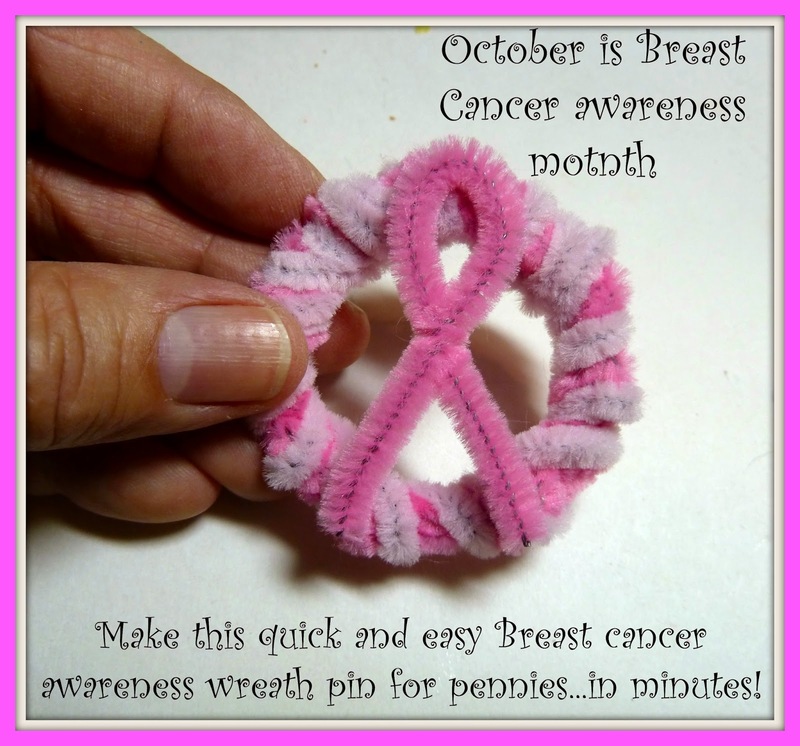 Show your support with this easy to make wreath awareness pin. You can make this pin in minutes for hardly any money and it's easy enough for kids with a little help with the glue gun! This is a great group project too! 1. Cut three dark pink chenille stems to 7 inches. Form into a ring and twist together. Use the needle nosed pliers to squeeze it together tightly. 2. Attach a dark pink 12-inch chenille stem to the ring and weave in and out all around. Repeat with a second dark pink stem. 3. Attach a light pink chenille stem to the ring and weave around in between the dark pink ones all around. Repeat with another light pink stem, making sure you weave it in between the dark stems. Adjust the shape of the wreath ring if necessary. 5. Use the hot glue gun to attach the awareness loop to the front of the wreath and a pin back to the back. I really need to go grab a bunch of chenille stems. You can make so many things with them. I chose this as my favorite and pinned! Thank you for linking up with Creative Style Linkup! Have a blessed weekend! I should make one for my mom… :-) Great craft idea! Thank you for stopping by to join Pin Worthy Wednesday! I've pinned this post to the Pin Worthy Wednesday Board. Hope to see you next week! Very creative and excellent tutorial! Sharing on Facebook this morning. Everyone should see this. This is a great way to show support for the cause.